Everything you need to get going apart from the plants! Wooden frame and fixings, pipes, connectors, water container, pump, plant pots, pebbles and detailed instructions. We even add a small spirit level. The kit is perfectly aligned with a slight incline for the water flow before you get it, as all the kits have been fully erected, set and dismantled before it arrives home with you. The spirit level is there to help you level your ground space, so the flow works. You only need to add plants, water and of course an electric supply. What size is the kit? The kit is 6' wide by 5' high. It is an A frame shape, so the base is approximately 15" deep. It is the size of a fence panel and comes out as far as a paving slab, if that's easier to imagine. The kit is free standing so can go anywhere in your garden, but not too much shade for the summer crop. We will be building smaller kits, 4" x 4" for smaller gardens, schools and this size will be great for people in wheelchairs who will be able to reach everything so still enjoy growing and tending plants and veg. Great to look at too. Balcony size..How about that, for people who want to grow their own veg but don't have a garden!! Watch this space. 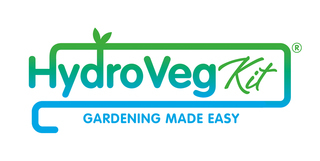 We are toying with an idea to make smaller HydroVeg kits for microveg, as this is really trending at the moment. Do I need an outside power point? Ideally, yes. However, if you're able to feed a cable to your kit without compromising your home security then that is OK. Check with your electrician for the best option. The kit doesn't use a lot of electricity as the pump is a small pond size pump. In the future we are looking to use solar pumps as an option on the smaller frames, can't wait till we can have a solar pump on the big frame. You will still need an energy supply though...you can never rely on the weather!! This year we had a timer swich put on out kits. What a blessing that has been!! In the summer we have had the pump on 7am to 8pm as it has been rediculously hot! and in the winter we will have it on daylight hours 8am to 5 -pm. Where should I locate my kit? Why is the Kit white? Ideally where it gets the sun and is sheltered from as much wind as possible. The plants do not have to be in full sun, they will still grow in the shade as long as there is a bit of sun. Watch out for the ripening of your tomatoes and strawberries though! The reason for the white pipes is that they deflect heat more easily. As there is only water flowing through the system, we don't want the water to heat up excessively. Also the pipes are more likely to be in the sun as you will be growing in the summer. I initially built a HydroVeg kit with brown pipes - it has my flowers in (see pics in the photo gallery), but it is primarily shaded from the sun so it doesn't affect the plants and stays cooler. We are testing aluminium pipes for the rest of this year!! Do you supply the plants? How do I plant them? No, you'll need to go to your local garden centre or order online, or start them off in a greenhouse if you have one. I go to the market and garden centres and buy plants that are small but established. Plug plants are ok but very small. When you get the plants, carefully take them out of the pot (best when they are drier), shake off all the soil, rinse off any remaining soil and place in the bottom of the mesh pot. I have tended to cut a hole in the bottom of the mesh pot to poke the roots through so they can reach the water flow. But not too much of a hole that the clay pebbles fall through!!! Fill 3/4 of the pot with clay pebbles (or 3/4 up the stem if the plants are very small). Pop the pot into the prepared hole in the pipe and check that the roots are able to reach the water. If preferred you can plant the veg without cutting the hole in the mesh pot as the roots will go and search for the water. However in that case I would pour some mineral-added water into the top of the pot a couple of times a day for about a week until the roots have found the water themselves. The position of each pot can be changed as the contents grow and spread out. Can I buy extra minerals from you? We have trialed many versions of the mineral feed, and we think AquaVega A and B is by far the best and easiest to use. Try adding some seaweed extract too, if you can find some. The plants love this, but only a few drops every now and again. What vegetables can I grow in the kit? You can grow anything that fruits or flowers above the ground: see Uses for your kit for lots of ideas. Can I grow fruit in the HydroVeg kit? Yes, we've had great success with strawberries and are trying container hanging basket blackberries this year too. Watch this space! I am sure gooseberries will work too so am going to work on that next year. Its fun to try these things. Can I grow flowers in the kit? Yes! The kit is ideal for flowers, and looks lovely with a combination of upright and trailing varieties. You can be creative and spectacular by having a flowing wall of hanging basket type flowers!! Send me your pics!! See some of my early pics in the picture gallery. The best this year have been petunias, begonias, (both upright and trailing), geraniums, million bells, and the silver green leaves that hang down. Really anything you would normally put in a hanging basket. I now put two plants in some mesh pots, one upright and one trailing to get double the effect. You can do this in a hydroponic system as the pot is only used to hold the plant, not grow anything in. Great eh!! Send me your ideas. I am lucky I have two HydroVeg kits, one for veg and one for my flower hanging garden. Perk of the job!!!! How often do I need to top up the water? It depends on the temperature. On very hot days, you need to keep an eye on the waterbox and top up every two or three days with small amounts. The pump noise will also increase if the water needs topping up. In cooler conditions you might not have to top up for a couple of weeks. I use a 5L water bottle to fill up as then I know exactly what amount of mineral feed to put in. ( 10 ml of A then 10 ml of B per 5 L water). HOWEVER as the plants grow their extensive root growth can stop the water flow. If this is the case your pump will be indicating it needs more water but you will find there is standing water in the pipes as the water can't get through easily. In this case lift out the pot of the offending plants and give the roots a haircut.!! Not too severe though. I sometines cut mine in a "V" shape removing more of the middle section, up to the pot, so that the outer roots pick up the water yet the water still flows through the middle. Then you will see your water flowing well again. REMEMBER with each 5L you need to add the mineral feed. Get in touch if you are worried and we can advise. If you know there is water in the system but the pump is still noisy it may mean that your pump filter needs cleaning. See answer to pump maintenance. How often do I need to add the minerals and how much? Every time you top up the waterbox with water you must add the minerals to it (10 ml of A then 10 ml of B for every 5L of water) . See the step-by-step instructions and also read the back of the A and B we sent you. This is the best mineral mixture we have used so far, and it's really easy to measure out! .We occasionally add a couple of drops of seaweed extract too. When your plants are very small, you may want to add some rooting stimulent to get the roots growing faster. Sometimes we have sometimes we haven't, the plants still grow the same. You can get rooting stimulant from your local hydroponics shop, however we will soon start to sell them in our online shop. If your pump is making a noise, and you know there is sufficient water running round the system, it probably need to have the filter cleaned, or one of the naughty plants is slowing the system down with its roots!! If it is the filter...thats is an easy job. Clean round the pump and relpace the sponge and front. Pop pump back into the water switch on and hear the silence!! If it is the size of the roots..that's easy too as we give them a hair cut!! We cut an upside down V in the roots so that the water carries on running through the middle and the roots are on the outside. No, it really doesnt harm them. In fact it encourages new and healthy roots to form. Do I need to change the water? What level of Ph does the water need to be? Every now and again, it would be advisable to test the PH of the water. Ideally it should be at PH6 - 6.5 (tap water is PH7). If the water is too acidic, ie. less than PH6, you can add a chemical called PH Up. If the water is too alkaline, ie. more than PH7, you can use - you guessed it - PH Down. Both are available from hydroponic shops and coming to our shop soon, too. To test the Ph you can buy strips of Ph paper from your local pharmacist, garden centre or hydroponics shop. Only once did we have an issue with the water becoming acidic, and all the plants started to droop. So we took out all the pots still containing the plants and washed and rinsed the roots of each plant in water. We totally changed the water in the water box and set up again. Phew!! They were alright and continued to thrive. Rain water can sometimes be acidic too, so if we have had heavy rain and you are using tap water for your system do a PH test. If you are using tap water then leave it for about 20 minutes of so until the chlorine has gone out of the water. (You dont need to, but I hate putting chlorine into my plants). We are very lucky as we have ph6 - 6.5 on tap every day as a by-product of our Kangen Water Ioniser. This gives us very high level drinking water at Ph9.5, to ensure we have a more alkaline body, and we eat our HydroVeg Kit veg all the time, which also helps create a more alkaline diet. The Kangen Water ioniser also gives us high acidic water which we use (as a bleach type liquid) to clean our worksurfaces, cooker, floors, handwash etc without the need for bleaches and cleaning fluids. (Not that we are geeks or anything, its just better than chemicals). The high acidic water Ph2.5 also kills the greenfly on our roses without pesticides! Wow it does so many things take a look www.h2o4livingwell.co.uk for information on this wonderful machine, and the health it creates. The hydroponics experts from HydroGarden (who advise us) suggest that you change the water every 3-4 months completely. The water is still full of great feed, so use it on your garden plants, or indoor plants, rather than waste it. That way the nutrients are at their best. Do I need to clean out the pipes? At the start of this year I took my whole system apart to clean it - and then realised it didn't need to be cleaned at all! Emptying and cleaning the waterbox is as much as you need to do. Do I need to keep the pump running all the time? No - we normally turn ours off overnight.